The creators of World of Tanks have released a statement apologising for some recent controversy surrounding a YouTuber called SirFoch. SirFoch was a Community Contributor for Wargaming, meaning he got early access to the game’s premium content, with which he was free to make videos with. One of his latest videos was very critical of a certain $80 tank, and Wargaming responded with threats of copyright claims and accusations of hate speech. 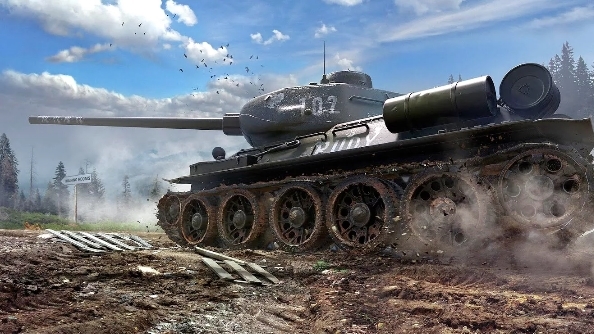 If you want more tire tracks, check out our list of the best tank games. SirFoch’s video addressed the Chrysler K GF, pointing out how it was seemingly designed to force players to splurge on premium ammunition to take it down. You see, the game’s model features two machineguns on the front – positions where the tank would have no armour in real life. When stripped back to the collision model, however, these guns cease to exist. There’s no weak point on the front of the tank at all. You can watch the video at this YouTube mirror, as it’s since been taken down from SirFoch’s account. In the video, SirFoch doesn’t hold back. It’s very sweary, but there’s nothing in there you could class as hate speech. Still, Wargaming dropped SirFoch from the community program and issued takedown threats. In one statement, Wargaming said they knew SirFoch wasn’t “the best role model”, but they still gave him a chance. “This might have been a mistake, since he used his status, influence, and the exclusive preview content he was given to defame Wargaming and World of Tanks,” said a spokesperson. Wargaming then expanded on their position in a statement provided to Kotaku. That last bit is where their statement falls down, as there’s nothing in SirFoch’s video that could be interpreted as homophobic or as hate speech. He just uses the F-word a lot. Wargaming have just released a new statement, however, admitting their handling of this situation could have been better and clarifying that they support players and Community Contributors’ right to be critical. Now Wargaming say they won’t take copyright action against opinions based on publically released content. So stuff that’s released will be fair game, but not preview videos, presumably. They also apologised for accusing SirFoch of hate speech.